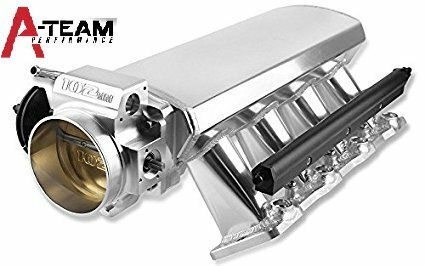 A-Team Performance 102mm LS LS1 LS2 LS6 Intake Manifold Throttle Body Sheet Metal Fabricated Silver LS1 LS2 LS6 EFI 15 THROTTLE OPENING FAST SHIPPING. -Fabrication: TIG Welded Aluminum? -Black Throttle Body: Included? -Gaskets: Included? -Hardware: Included? -Black Fuel Rails?Included? 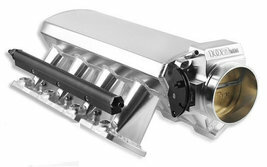 -Fuel crossover line: Included -Intake is about 2" taller than stock Features:? -Black 3mm Sheet Metal Aluminum? -The intake will not bend or flex With Boost Or Vacuum.? -Black Fuel Rails With Braided Fuel Line Is Included? -These will fit cathedral style LS1 LS2 LS6 4.8/5.3/5.7/6.0 heads??? Application:? -This intake will fit Cathedral Port LS1/LS2/LS6 heads?? CHEVROLET SMALL BLOCK V8 GEN. III/IV (LS-BASED) 4.8 L / 293 in3 (LR4) 5.3 L / 325 in3 (L33, L59, LM4, LM7) 5.7 L / 346 in3 (LS1, LS6) 6.0 L / 364 in3 (LQ4, LQ9, LS2) Package:? Included:Black Intake Manifold, Black Throttle Body, Gaskets, Hardware, Black Fuel Rails, Fuel Crossover Line.